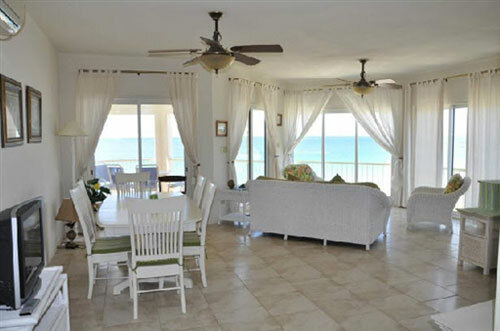 Turtle's Nest Beach Resort was reviewed by Kristin Bourne. 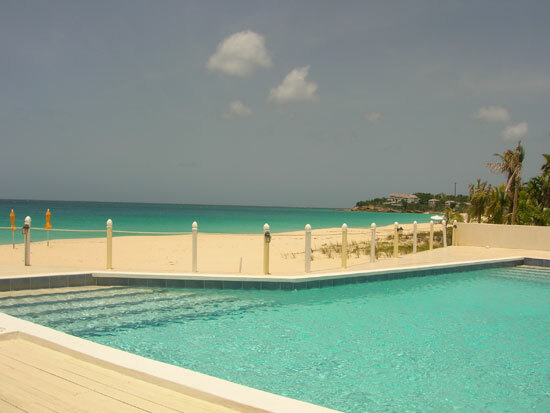 Large, high-ceiling, condo-style units on Meads Bay, Turtle's Nest Beach Resort offers comfortable units, ideal for those spending 1 week+ on the island, and a tremendous location on one of Anguilla's best beaches. The price is right, too! 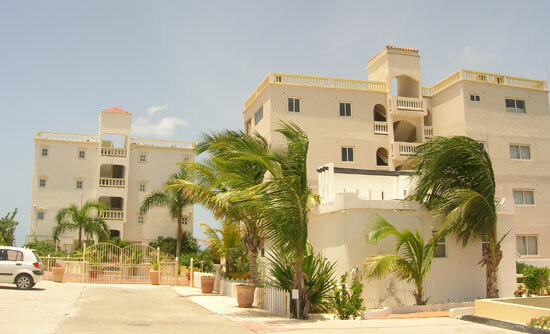 Turtle's Nest Beach Resort is an Anguilla condo complex and reasonably priced Anguilla hotel. 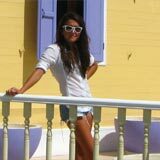 Each unit is privately owned, used by the owners when they are on-island, rented out by management when they are not. 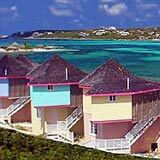 Located centrally on majestic Mead's Bay, we hear generally good reviews about Turtle's Nest. Nearby Carimar, though, consistently garners top rankings at review sites and is somewhat less expensive. Looking at the non-beach side of Turtle's Nest, from the parking lot. 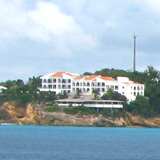 The hotel sits close to the half-way mark of one of Anguilla's most impressive stretches of beach, Meads Bay. chairs and umbrellas, and blue...ahh! Meads Bay is in the western end of Anguilla and offers some of the most remarkable and memorable sunsets! 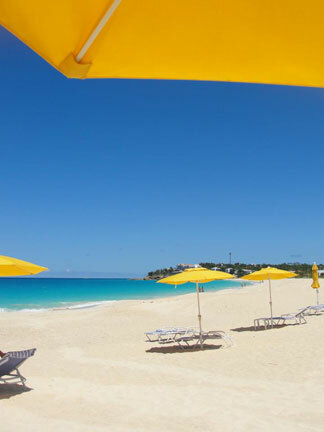 Meads Bay's beach is wide and full of fluffy, soft sand which gently angles toward the pure, luscious turquoise water of the sea on the northern side of Anguilla. Meads Bay is one of the most popular beaches in Anguilla, second in fame only to East Shoal Bay, but preferred by many "in the know" visitors. Despite its popularity, you will still find Meads to be quiet and relaxing. After all, there are no 30-story high-rises in Anguilla to jam its beaches with people. Anguilla is "low-density," no matter how popular a beach may be. Blanchards, Blanchards Beach Shack, and Jacala . These lunch and dinner locations (Blanchards Beach shack is highly recommended for lunch, Jacala for lunch and dinner, and Blanchards is only open for dinner), are located to the east of hotel. They are a right turn from Turtle's Nest when you are on the beach. Capping off the eastern end of Meads Bay is Malliouhana Resort. Very close to Turtle's Nest is the small boutique hotel called Frangipani, its new and chic boutique called Petals, and one of the best restaurants on the island, Straw Hat Restaurant . Frangipani, Petals and Straw Hat are all located to the West of Turtle's Nest (a left turn). Straw Hat is a favorite for breakfast, lunch and dinner. Further past Straw Hat there is Anacaona and their restaurant Firefly, and Viceroy Anguilla Resort. Viceroy has many fine dining options (for breakfast/lunch/dinner), and more casual options for drinks and snacks. When it comes to location, Turtle's Nest gets five stars! 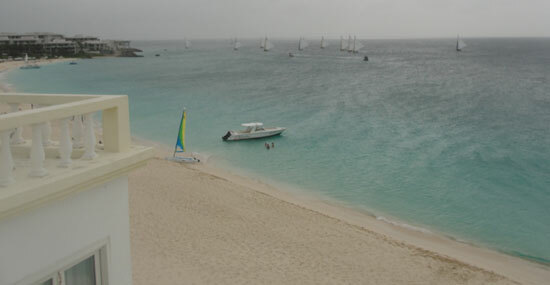 Note: If you are traveling to Anguilla in the winter months, Meads Bay can be a dangerous spot to swim. The swells here can get up to 8'. The waves are fun to play in, but it is not the best beach for "floating" that time of year. Turtle's Nest consists of two twin-like 4-story white buildings. 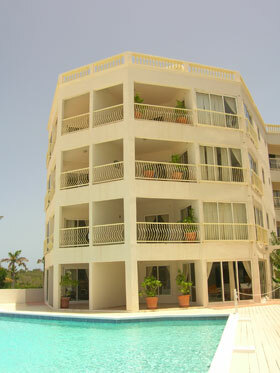 These Anguilla condos strike me as structures you would see on a busy beach in St. Maarten. Turtle's Nest lacks the character of charming Anguilla hotels, like Carimar Beach Club, just down the beach. The western building sits closer to the sand than the eastern building. The buildings do feel a little worn. The large and inviting pool sits immediately in front of the eastern building. A couple quick steps down from the pool and your feet are sinking in to the sand of Meads Bay! Just a few more steps and you will find beach chairs and pretty yellow umbrellas, which are at the ready for Turtle's Nest guests. Each unit is slightly different, dressed up in unique themes. From the nautical themed, with white wicker furniture and navy and whites, to the more urban-inspired, with modern finishings and appliances, the units are all quite nice and comfortable. We have heard that certain rooms feel old. Each one has air conditioning and full amenities, including kitchen appliances and washer/dryer, WiFi, telephones, and TVs with cable. 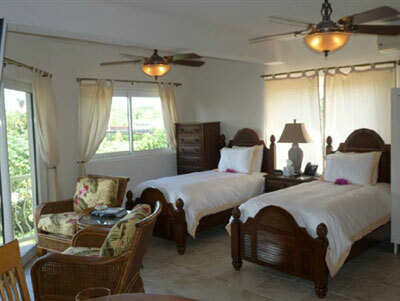 The "rooms" at this Anguilla hotel feel more like large apartments than traditional Anguilla hotel rooms. The condos range in size from studio to 3 bedrooms, square footage ranging from 490 (studio) to over 2,000 (3 bedroom). A bedroom featuring twin beds. The 1-3 bedroom units are all "beachfront", and the studios are "beachview" as they are positioned on the sides of building. The 3 bedroom units can sleep up to eight people. The studio is the smallest option and would be ideal for a solo traveler or two people. A living room as seen from the kitchen. Look at that view! Here's the August Thursday boatrace as seen from the roof of the Turtle's Nest! Tip: Turtle's Nest does not have an elevator. You may want to consider booking a lower story unit if you struggle with stairs or are bringing lots of heavy luggage. Likewise if you like the exercise... Go for the top floor units! 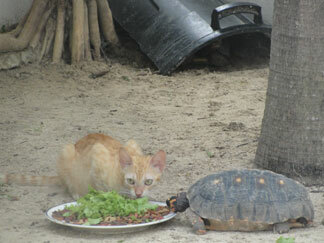 and a tortoise sharing a meal? The property entrance has a guards' house and private parking lot. Parking your Anguilla rental car would never be an issue. Another nice little treat (especially for the animal lovers!)? As you walk from the parking lot to the buildings, you will pass by them. They are actually easy to miss since they are in sandy areas segmented off on each side of the walkway and they are silent and usually sleeping except for when "dinner is served". Don't forget to look for them if you are staying at The Turtle's Nest Beach Resort! Turtles can be spotted here too, laying eggs on Meads Bay in the summer! The resort is true to its name. As a condo rental, there is no restaurant on-site, nor room service or concierge. Staff is attentive to any problems related to the property, however. Prices are fairly high for the largest units ($700) and scale down to $330 (per night) in the high season, lower in the off-season. Turtle's Nest Beach Resort is an option worth considering if you are a DIY traveler looking for a comfortable rental on the beach.